An industry that offers important benefits to aging and physically and mentally challenged Georgians faces some challenges of its own. When her widowed mother reached a point where she could no longer manage alone in the home where she had raised a family, Nancy Hobby of Valdosta considered different options for her mother’s care. Skilled nursing care – a nursing home – provided a more restrictive environment than her mother wanted or needed, and an around-the-clock home caregiver was prohibitively expensive and wouldn’t provide her mother interaction with others her age. Instead, Hobby chose a third option – a licensed personal care home, more commonly known and referred to as assisted living. Today, at 95, her mother, Hilda Griffin, is thriving at Fellowship Home at Brookside, a spacious 142-bed facility in Valdosta, says Hobby. She has her own personal room, large enough for a queen size bed and other favorite pieces of furniture from her home; nutritious meals; planned activities; the companionship of other residents and staff; and two special perks – her favorite cookies and a 400-acre rural setting that reminds her of her childhood home. For Hobby, choosing a licensed personal care home was the right choice, she says, offering the security of 24-hour caregivers with the comforts of home. And though she doesn’t want to look too far into the future, she hopes her mother will be able to stay at Fellowship Home the rest of her life. New legislation increases the chances that Griffin and many of the other 30,000 Georgians, mostly elderly, living in the state’s 1,992 licensed personal care homes will be able to live out their lives in the homelike setting they have grown to love by giving larger facilities the opportunity to provide more extensive services that residents often need as they grow older and more frail. Ironically, however, the same legislation presents challenges, putting naming restrictions on an industry that has worked for decades to brand its services as assisted living. 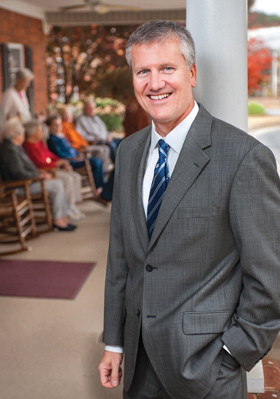 Traditionally, personal care homes have been licensed by the state to provide assistance with activities of daily living such as hygiene, bathing, meal preparation, transportation to medical appointments and oversight and assistance with medication, says John LaHood, senior administrator of Fellowship Home at Brookside and president of the Assisted Living Association of Georgia (ALAG). ALAG is a statewide nonprofit organization made up of individuals and companies actively involved in the management and ownership of assisted living communities. The organization’s primary mission is to inform the general public and involved professions of options and opportunities available that will be helpful to them, either as consumers or providers of senior services. The passage of Senate Bill 178, however, could change that, closing the gap between personal care homes and skilled nursing care. Under the bill signed into law by Gov. Nathan Deal in May 2011, licensed care homes with 25 or more beds can apply for a sub-permit to provide a higher level of care in those homes. “The difference is that an assistive living community must employ certified medication aides to administer medications. Another major distinction is that homes with the new assisted living community licensure can assist with self-preservation, a term that describes a person’s mobility and ability to ambulate to a point of safety in the event of an emergency,” says LaHood. In traditional homes, staff members can assist residents who need help self-administering medications – by opening medicine bottles or providing a glass of water, for example – but staff cannot administer the medications themselves. They also cannot house residents who are unable to walk to a point of safety if necessary. Thus, a change in the residents’ ability to walk or to take medication with assistance would necessitate a move to a skilled nursing facility, a move that could be costly both financially and emotionally. While there is certainly a place for skilled nursing care for many people, for other people a personal care home is a better option, says LaHood. Experts cite a number of reasons for choosing a personal care, or assisted living, home. Two key ones are cost and an environment that is more like home. Whereas the average cost of skilled nursing care in Georgia is $6,500 monthly for a semi-private room, licensed personal care homes average less than half that amount – $2,818 for a private room, according to the 2011 MetLife Market Survey of Nursing Home, Assisted Living, Adult Day Services, and Home Care Costs. In Atlanta, homes tend to be higher, not surprisingly, and in rural parts of the state some are lower, says Dan Day, president of Gaines Park Assisted Living in Kennesaw and immediate past president of ALAG’s board of directors. Besides location, cost is influenced by specific services included and the level of care needed. The biggest cost-savings is to taxpayers, who foot the bill for the majority of care provided in skilled nursing facilities, says Petrea. Nursing homes are paid for almost entirely by public funds. In Georgia, 73 percent of skilled nursing facility revenue is Medicaid alone, he says. In addition, Medicare pays for the first 90 days of skilled nursing care, but it never pays for assisted living. Assisted living, in contrast, is almost always paid for entirely or almost entirely by the residents themselves. Only 10 per-cent of assisted living beds are covered by Medicaid through a handful of Med-icaid waivered programs (see “Med-icaid Waivered Programs,” opposite). This discrepancy in public funding, says Petrea, keeps many people from benefiting from the less restrictive environment of personal care homes and in many cases causes unnecessary expense to taxpayers. Ironically, people end up in nursing homes when they can’t afford assisted living, says Day. “The entitlement, if someone needs care, they go into a nursing home, which is the most restrictive, expensive arrangement,” he says. For people who have exhausted their own resources, Medicaid reimburses skilled nursing care at an average rate of $143 a day, whereas Medicaid-waivered programs reimburse licensed personal care homes at $35 a day. Beyond cost savings, assisted living provides other benefits to people who don’t need skilled nursing care. These include the privacy of a personal room, companionship with other residents and access to activities and outings, all in a less restrictive and home-like setting. In fact, many personal care homes in Georgia are just that – homes. Some 80 percent of the licensed homes in Georgia have fewer than 25 beds – and many have just two, three, five or 10, says Petrea. Many of these are located in residential neighborhoods in people’s homes. This desire, he says, has led to a trend referred to as aging in place, a trend which itself is evolving. In the early ‘90s, when Atlanta gerontologist Alexis Abramson, Ph.D., was new in her career, she associated aging in place with what she calls the “white-knuckle syndrome,” seniors hanging on to their homes at all costs, refusing to leave to go to nursing homes. But for many seniors today, aging in place may simply mean staying in the same community where they raised their families, where they can visit their families and friends, perhaps attend their place of worship, shop in familiar stores and keep their doctors, she says. For those who can afford them, personal care homes provide the level of care they need to meet their physical needs and a variety of activities to meet their emotional needs. Since its inception, ALAG has supported legislation to help people age in place. The hope is that SB 178 and future legislation will offer that opportunity to more residents – and future residents – of personal care homes. While the new licensure is positive for seniors wanting to age in place at larger homes that offer these expanded services, unfortunately it also had a less positive unintended consequence – a restriction on the use of the term assisted living. “Assisted living has been the common term to describe our industry for decades, but unless something changes, the terms ‘assisted living’ and ‘assisted living care’ will become exclusive to licensed Assisted Living Communities beginning May 1, 2013,” says LaHood. It should be noted that not everyone involved in the assisted living industry wants to see a name change; some believe the law should remain as it was written. Construction design has also become a troublesome issue. Many personal care home providers that meet all the resident care requirements to become licensed as an assisted living community can’t get a license due to existing buildings that do not meet the State Fire Marshal’s standards for a Limited Healthcare Certificate of Occupancy, says LaHood. “ALAG and other industry leaders are working with legislators and state officials to modify some of the unintended consequences of SB 178,” he says. Aside from these issues, experts say the legislation is an important step toward helping personal care homes serve sicker people, when necessary, thereby increasing the chances that people like Hilda Griffin will be able to spend the rest of their lives in a place they have grown to love.